WASHINGTON (Jan. 30, 2015) -- The 15th sergeant major of the Army was sworn into office Jan. 30, 2015, bringing with him a wealth of experience from both the operational and institutional Army. Before administering the oath of office to Sgt. Maj. of the Army Daniel A. Dailey, Chief of Staff of the Army Gen. Ray Odierno explained what it is he believes Dailey will bring to the office. 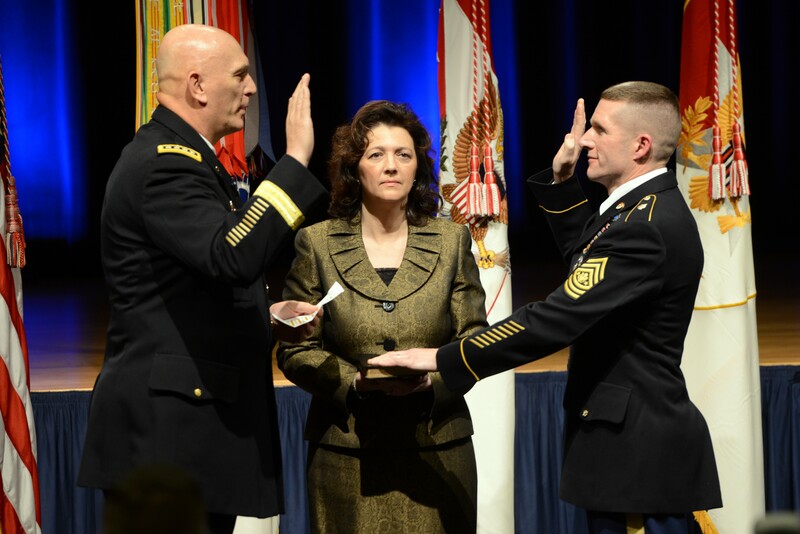 Chief of Staff of the Army Gen. Ray Odierno administers the oath of office to the Sgt. Maj. of the Army Daniel A. Dailey, Jan. 30, 2015, at the Pentagon. Dailey's wife, Holly Dailey, holds a bible. The general said the first time he met Dailey, the non-commissioned officer had been a platoon sergeant. Subsequently, he served as a battalion sergeant major, brigade sergeant major, and division sergeant major. Dailey also has in-depth institutional experience, Odierno said, having served as the command sergeant major at TRADOC. "He brings this broad experience of both understanding the institutional side as well as the tactical and operational side," Odierno said. "In my mind, there is no one more qualified to take on the responsibilities and the challenges our Army faces in the future." The general named three such challenges, saying they are concerns he thinks about every day. He said he believes that Dailey will be able to help address those challenges, as did Sgt. Maj. of the Army Raymond F. Chandler III before him. First, he said, is the continued commitment of Soldiers across the globe -- as many as 140,000 Soldiers are now deployed or forward stationed. "It's our responsibility to ensure they have the resources and tools necessary to do their jobs. And that we develop NCOs ... so they are able to lead our Soldiers anywhere." Secondly, he said, is the downsizing of the Army. "How do we maintain the strength of our Army by keeping the right NCOs in the force, but while also taking care of those who raised their right hand and were willing to serve this nation in a time of war, and how do we properly transition them and do it the right way?" Finally, he said, is planning for the future of the Army, to plan for what the Army will need to continue to maintain the security of the United States. With all of those issues, Odierno said, he believes that Dailey will serve as an advisor and leader to help the Army make the right decisions. "Sgt. Maj. of the Army Dan A. Daily is the one who can lead us that way," he said. "He understands those problems and he understands what it will take. I know his preparation and leadership and experiences will help us to lead this great Army into the future -- and to ensure that this Army will remain the greatest Army in the world." After being sworn in to office, and swapping out his uniform coat for a new one that bears his new rank insignia, Dailey explained how he, a self-described "middle of the road guy," was able to rise to the highest enlisted position in the Army. "As a young man I was a pretty average kid," Dailey said. "I did well in school, but I wasn't the valedictorian. I was somewhere in the middle of the class. I played high school sports. But I wasn't a superstar athlete. I couldn't play in the band -- because I don't have any musical talent at all. I'm even average by military standards: 5-foot 9-inches, and 161 pounds, as of this morning. I checked. By all accounts I was a poor, average kid from Northeastern Pennsylvania. "How does a middle-of-the-road guy make it to this rank? To represent the finest fighting forces the world has known?" he asked. "The answer is simple. It's sitting in the seats in front of me. It's leadership -- leadership from great Soldiers, non-commissioned officers and officers that I served with over the years. These are the people who make Army leaders." Daily said leadership is not born, but is rather built. "I am merely a product of the best the Army has ever had to offer," he said. "I am grateful for that." Dailey thanked both the officer and enlisted Soldiers who helped shape his career, as well as civilians in government and those from his home town, including his high school principal. Dailey also thanked his mother for developing in him and his brothers "the ethical and moral foundations we needed. Mom, thank you and I love you." He also thanked his father, an Army veteran who recently passed away. "He taught us boys a strong work ethic and discipline. And he ensured we all had a sense of patriotism. Dad, rest well, and the boys are all okay." He also thanked his two older brothers, saying that as the baby of the family there had been for him both privileges and sacrifices. "My brothers felt it was their responsibility to begin building my resiliency at a very young age," he said, drawing laughter from the audience. "In the Dailey house, resiliency is code-word for 'the punching bag' during their live re-enactment of Saturday morning episodes of Kung Fu Theater. Brothers, you made me strong. Thank you. But don't try it now. Combined with years of military service, and the fact of this stage of your life -- the younger samurai now has the advantage." He mentioned also his younger brother. He thanked his wife Holly: "I love you for sticking by me for 21 years, and the seven I wasn't there; but most of all because you're my best friend. Thank you." Finally, he thanked his son, Dakota. "I'm so proud of you ... you're the reason why I get up every day and work so hard. You really are." "All of these people, from the former leaders to my family, made it possible for an average guy to be the representative for a million of the nation's best and brightest," Dailey said. "That's why I'm convinced that anyone can be the sergeant major of the Army. Any Soldier in today's Army, even an average Soldier like me, has the potential to be an Army senior leader some day. It just requires two things: great leadership, and a strong Army family."